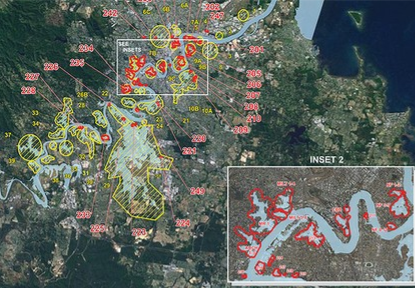 Following the January 2011 flood in Brisbane, there was a need to create a surface of the flood. This was needed to try and explain the behaviour of the flood and to inform the Council for future planning. More than 100 surveyed levels were taken of the maximum flood height along the extent of the river. The intent was to apply these heights to the ‘centreline’ of the river to produce a profile. Heights would then be able to be interpolated between the surveyed levels. When the profile was produced, the profile did not fall as expected from upstream to downstream and generally did not look ‘right’. There were areas where the downstream levels were higher than upstream. Initially, survey errors were suspected. The errors that could have arisen were from mistaken identification of the flood height or basic surveying errors. Problems with the surveyed levels were eliminated. The problem was how to explain the obvious inconsistencies and produce a rational flood surface. After analysing the survey information and discussing potential solutions with hydraulic engineers, it was determined that the best option was to attempt to model the super-elevation effect that occurs when the faster moving water on the outside of a bend is higher than the slower moving water on the inside of the bend. The water is assumed to be ‘level’ outside the banks of the river. To test the proposition, strings were digitised along each bank of the river, and the surveyed levels were applied to the end of the strings and the string graded. Initial trials proved to be encouraging but the number of surveyed points did not give a satisfactory result. The solution was to use LiDAR data and the Nearmap image taken within 24 hours of the flood peak. From the image it was possible to see the flood extent and at these locations, ground elevations were extracted from the LiDAR data to supplement the surveyed levels. This solution proved to be satisfactory. Once the bank strings were created and graded, they were paralleled out until they were outside the extent of the flood. Creeks and gullies were enclosed by a string and graded from start to end. These strings were tinned and the resulting contours reflected the super-elevation effect. The flood surface tin was intersected with the terrain surface created from LiDAR data to produce an extent of the peak flood level. The correlation between the extent of the peak flood level and the Nearmap image particularly in areas where there were no surveyed levels or levels extracted from LiDAR confirmed the value of the process. The ability to use the modelling tools within 12d Model to develope a TIN which was not created by direct measurement such as survey, or by rules such as a road design, was invaluable to this project.